Nothing like getting a guy who can feasibly go two completely different ways… then going into two solo queue games and getting to perform each role. Thanks, guys in that game, you made my job a lot easier. Anyway, let’s talk about the Defender of Tomorrrooooow! Let’s talk aesthetics real quick. Jayce has the perfect retro-futuristic look going on, from his outfit to his general personality, the guy looks like he wouldn’t be too out of place in one of those ‘Home of Tomorrow’ illustrations or the cast of Bioshock: Infinite. 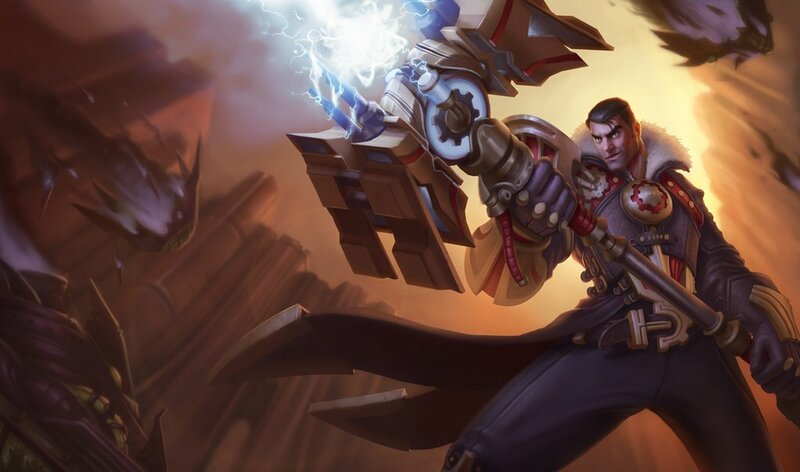 I haven’t seen Full Metal Jayce in action, but the model itself looks pretty great and he apparently has a modified voice like Soul Reaver Draven, which means this is gonna be a regular thing. Now, playstyle is going to be kind of weird to write, because Jayce can honestly excel at two completely different roles and he’s designed to actively switch between them. His hammer form is a very typical bruiser, complete with gapcloser and (I think) attack timer reset. He also gains some bonus defenses (which scale with his ultimate). Using the Mercury Cannon, however, Jayce becomes an incredibly dangerous ranged AD carry with a surprisingly hard-hitting AoE skillshot. Jayce’s biggest strong point is how versatile he is. Like I said early, he’s really good at both roles, so he can adapt pretty easily. It also helps that he can switch to hammer and jump on (and slow) an enemy for a nice initiation, or swap out for his cannon in order to get in some ranged poke or snipe someone with an Accelerated skillshot. However, he does have some problems in his limited mana pool (meaning that spamming will bleed you dry) and the fact that he’s a jack of all trades. He does his job well, but there’s probably someone else out there who could do it better. As far as leveling up skills, I’ve always maxed Q for both stances. To the Skies scales incredibly well (1.0 AD) and lowering the cooldown is always useful for fights. Shock Blast scales even better (1.2) and is a ranged Jayce’s main form of harass, especially with Acceleration Gate. After that, get your two W skills, Lightning Field and Hyper Charge. Lightning Field’s passive gives Jayce a nice bit of mana regen (and the active isn’t too shabby for skirmishes or teamfights), whereas Hyper Charge allows Jayce to tear through towers and champions with ease. After that, concentrate on Thundering Blow and Acceleration Gate. Blow is only good for knocking people away (or into your buddy) and the Gate doesn’t gain any duration and only a bit of movement speed with each rank. In terms of items, I stick with some pretty normal builds. If I’m going bruiser, I get the appropriate gold per 10 items, a Sheen, and then whatever’s needed to counter the enemy team. Cannon Jayce starts with boots and potions, grabs an early Sheen or two Doran’s Blades, then usually a Bloodthirster. I haven’t had any games get into any real sort of endgame, so I’ve only gotten to Bloodthirster with Cannon Jayce. I expect you may want an Infinity Edge somewhere in there, what with Hyper Charge’s attack speed boost. The only real general advice I have for him is remembering your focus. If you’re going primarily cannon/ranged, don’t try and be a hero and initiate a fight in hammer stance. Sure, it’s good for slowing someone or knocking them away, but you don’t have the tankiness to eat a lot of hits. Also, the best thing you can do in lane after getting Acceleration Gate is to land accelerated Shock Blasts as often as possible. Even if it’s not a direct hit, the blast still explodes at the end of the range. I don’t care if you’re bruiser or ranged carry, this thing hits like an angry truck at early levels. So, should you go out and defend tomorrow with Jayce? I’d… say if you like the general idea of Nidalee, being able to perform entirely different roles and whatnot, but want something more cohesive and designed to use all your skills instead of just defaulting to one or the other, then yeah definitely. Or if you just dig the retro-future look (which admittedly sold me on him), you might want to give it a week or get some more opinions. All I can say is that I’m loving him, and if you guys pick him up, I hope you do too. Anyway, thanks for reading and have a good’un. This entry was posted in League of Legends, Video Games and tagged jayce champion impressions, jayce league of legends, jayce review, jayce the defender of tomorrow, league of legends, lol game, lol new champion. Bookmark the permalink.